By Audrey Golden. Jan 11, 2018. 9:00 AM. The Dickens house is located at 48 Doughty Street, a relatively short walk from the British Museum and the British Library. As we mentioned, the house has been turned into a museum for visitors, and anyone can stop in for a visit from Tuesday through Sunday. Tours are offered from 10:00 a.m. until 5:00 p.m., with the last admission at 4:00 p.m. Once a month, a museum remains open until 8:00 p.m. for late-night visitors. If you visit the house, you can see inside Dickens’s study, which includes objects such as the desk where Dickens wrote Oliver Twist, The Pickwick Papers, and Nicholas Nickleby. Visitors can also see handwritten drafts of those novels, as well as furniture and other objects original to the Dickens home. If you decide to stop by 48 Doughty Street, you’ll also learn than that Dickens and his wife raised their three oldest children in the house, and that this space is also research center for Dickens scholars. 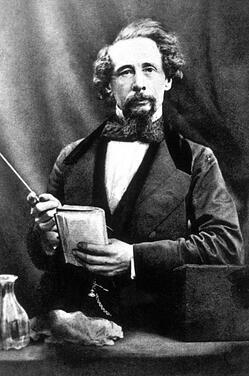 If you only have a short time to stop by Dickens’s home, you can tour the house and museum. But if you’re a researcher, then the museum has a lot more to offer. It’s also an international research center for the works of Charles Dickens. It hold the “most comprehensive collection of material relating to his life and work, with over 100,000 items including furniture, personal effects, paintings, prints, photographs, letters, manuscripts, and rare editions,” according to the website. 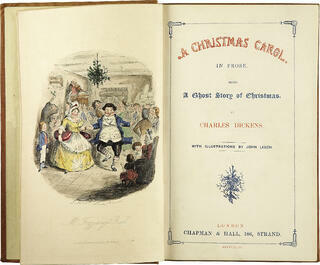 Only a small selection from the Dickens archives are on display in the house at any single point. As such, if you’re interested in seeing more, you’ll need to make an appointment through the museum’s library. As with other special collections libraries and archives, the museum is excited to host researchers interested in various aspects of the collection. We highly recommend a stop at the Dickens house and museum if you find yourself in London. And if you’re hungry for more Dickens, you can download the “Dickens Trail App,” available for download from the museum. Have a great visit!